The global agricultural disinfectant market is foreseen in a report by Transparency Market Research (TMR) to find two or more companies such as The Chemours Company and The Dow Chemical Company showing their dominance in the coming years. With a view to achieve their goals, players could take to combined researches by shaking hands with other companies in the market. The nature of the vendor landscape could be vastly consolidated and highly competitive. Some of the top companies operating in the market other than the aforementioned ones are The Stepan Company and Zoetis. 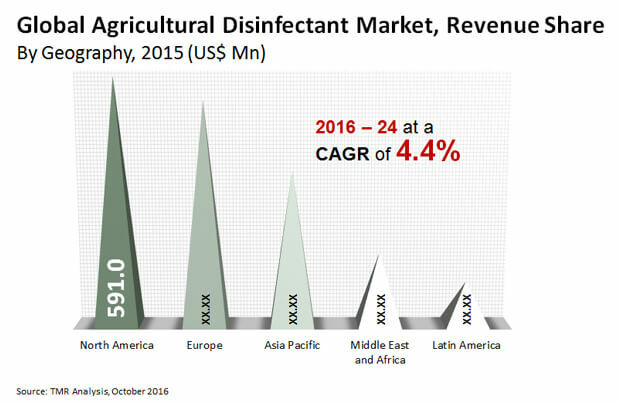 TMR envisages the global agricultural disinfectant market to rise at a 4.4% CAGR during the forecast period 2016-2024 to be worth a US$2.5 bn by the end of 2024. Among other forms, liquid agricultural disinfectant could rank higher in the market while expanding at a CAGR of 4.9%. Regionally, Asia Pacific could show faster growth in the market while expanding at a 5.6% CAGR. Rising use of powerful disinfectants and increasing focus on routine cleanliness of farms are predicted to set the tone for valuable growth of the global agricultural disinfectant market. The demand in the market could be boosted with the need to ensure complete food security through sterilization or removal of harmful microorganisms. The growth of the market is projected to gain support from technological advancement in greenhouse production of fruits and vegetables and vertical farming. The demand for agricultural disinfectant could see a rise as a result of the rise of livestock application. High increase in meat consumption and rising prevalence of livestock diseases are foretold to push the demand in the global agricultural disinfectant market. The need to adhere to government regulations, improve performance of agricultural disinfectants, and minimize operational costs could further increase the demand until the end of the forecast period. Lack of knowledge about the proper application of agricultural disinfectant is envisioned to cause problems to the market in terms of growth. Wrong knowledge about the ill-effects of agricultural disinfectants on plants could also negatively impact market growth in the foreseeable future. Farmers in underdeveloped countries may not be financially able to afford agricultural disinfectants. This could be another growth restraint of the market. However, developing regions such as Asia Pacific are showing quicker progress in the market. Rising need for crop protection with increase in population is expected to create a whole lot of opportunities in the global agricultural disinfectant market. Growing emphasis on the improvement of the effectiveness and quality of agricultural disinfectants through research and development could be a primary factor responsible for the growth of the market.